In that very simple case, most of the time question words would be at the end of the statement, but they can also sometimes be at the beginning of the statement. Note that what can only be at the end of the sentence, and you use quoi and NOT que. Note that in who [does] questions, qui [fait] will always be at the beginning, but in other cases, qui (whom or who is it) can be at either place. 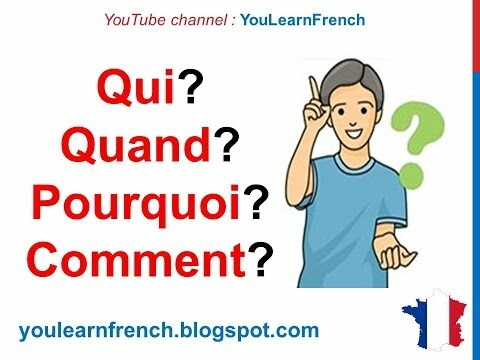 See Questions: Qui, qui est-ce qui = Who ? and Questions: Qui / qui est-ce que = Whom ?. Quand est-ce que vous quittez Chicago? When do you leave Chicago? -> Note that in this last case, que becomes qu' because it's in front of a vowel. Pourquoi ont-ils des rayures ? Why have they got stripes? Qu'écoutes-tu à la radio ? These question words are always placed at the start with inverted forms. Asking "Comment il s'appele" is correct???? And is it correct comment est ce que le chat voit? Is it correct Comment est ce que le chat voit dans le noir? You are hearing right and it should be "partent-ils"(3 syllables). I thought that in the 3rd person plural in the present tense, the "ent" was never pronounced. Forgot to tick to recieve your response. The 'ent' is not pronounced but in 'partent-ils' you have to sound the last 't' of the 'ent'. If you didn't you would hear the singular 'part-il'. You might hear it pronounced in every day speak as two syllables but with an emphasis on the 't' to make it a double sound. The question words are always placed at the start in the inverted question form. D'accord , J'ai compris.Merci beaucoup.